All Christmas Merchandise Half Off December 16-23! Are you putting the finishing touches on your holiday décor just in time for Christmas? 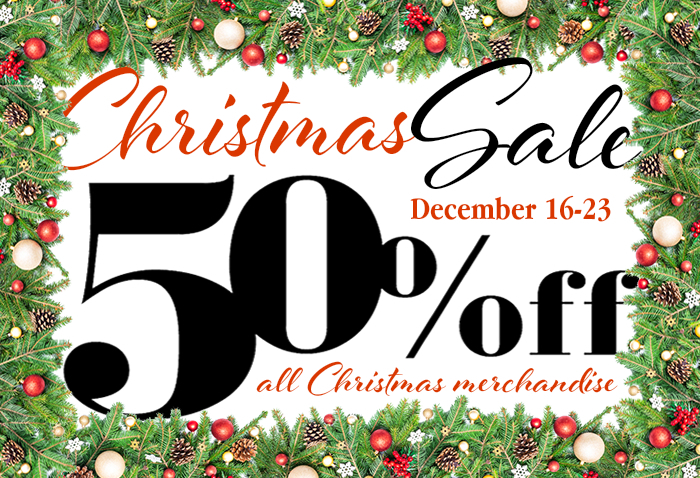 Well head to Goodwill between December 16 and December 23 when ALL Christmas merchandise is 50% off! Stock up on ornaments, wreaths, stockings, garland, lights, Santa figurines, light-up reindeer and anything else on our shelves that might put some extra jingle in your holiday season! And, while you're shopping for décor, why not pick up some last minute gifts too? Don't forget, Goodwill gift cards are also perfect for those hard-to-buy-for folks on your list! Save More When You Spend More on December 15! On the 15th of every month we celebrate YOU—our Club Goodwill REwards members! So shop Goodwill this Saturday, December 15th and save more when you spend more! Spend $15, save 15%. Spend $20, save 20%. Spend $25 or more, save 25% on your total purchase! White Elephant Sale - December 14! Are you looking fun and creative gifts for your White Elephant party? Or maybe you just need to finish up your Christmas shopping? Goodwill is a great place to find all sorts of one-of-a-kind gifts and now, for a limited time, when you sign up for Goodwill text alerts you'll save even more! Just text "GIFT" to 31823 to receive 20% off your total purchase when you spend $20 or more on Friday, December 14th! We have a whole new way to see some of the great merchandise available for sale in several of our Goodwill Store & Donation Centers in southeastern Wisconsin and metropolitan Chicago! Follow Shop AmazingGoodwill on Facebook to stay up-to-date on the unique items coming through our doors! Looking for the perfect gifts for your White Elephant exchange? Look no further than your nearest Goodwill Store & Donation Center! Attend a Hiring Event in Mundelein! Are you looking for an amazing career opportunity? Then check out our hiring event on Wednesday, December 5 at our Goodwill Store & Donation Center at 761 S. Midlothian Road in Mundelein from 10 a.m. to 2 p.m. Fill their Stockings with a Little Goodwill Cheer! St. Nick Day is Thursday, December 6th! Make sure you fill up those stockings with a little cheer from Goodwill! We have the perfect stocking stuffers for kids of all ages—and don't forget, Goodwill gift cards make great gifts too!